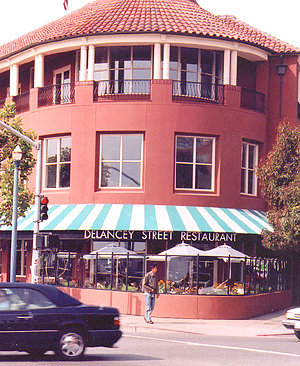 Delancey Street Restaurant is a key training school of the Delancey Street Foundation, the country's largest self-help residential organization for people who have hit bottom to completely rebuild their lives. Like the immigrants who came through Ellis Island to Delancey Street on New York's Lower East Side at the turn of the century to start new lives, newcomers to Delancey Street Foundation are "immigrants" of all races, all ages, all backgrounds, who come together in this community of last resort. For 40 years, Delancey Street has provided a home and all services to thousands of residents at no cost to the client and no cost to the taxpayer. We earn our money through enterprises such as this restaurant which train our residents and also support our operation. All tips are considered donations, and all restaurant proceeds after food costs go directly to house, feed and clothe our residents and teach all skills, values and attitudes needed for a successful drug-free and crime-free life in the mainstream society. Since our inception, Delancey Street has sought to keep the best traditions of America alive: an extended family, the work ethic, people joining together committed to hard work and a "can do" confidence, to discipline and dignity, to self-respect and service to others. The food in our restaurant follows this heritage in that it is familiar cuisine: comfortable, homey food, connecting us to family memories. Our menu, which changes daily, combines foods from residents' particular ethnic or regional backgrounds with traditional American cuisine. Many of our recipes come from our grandmothers, and we try to focus on the ethnic idiosyncrasies of each as well as the cross-cultural blending of all. In an extraordinary spirit of community service, the owners, chefs and wait staffs of the finest restaurants in the City have helped train us to cook, manage and serve in our restaurant which was designed, built, and is operated completely by Delancey residents. Our thanks to Allegro, Alejandro's, Perry's, Postrio, Roti, Square One, Tommy Toys and Washington Square Bar & Grill restaurants. And to Backen Arrigoni and Ross, the architectural firm who helped us design the restaurant. Our highlights are because of all their help; the fumbles are our own. 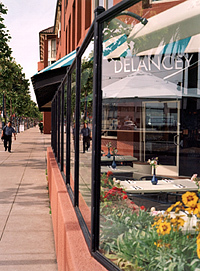 Since we opened in 1991, the Delancey Street Restaurant has received wonderful responses from the press, from television, and most importantly from our customers. Repeat diners comprise most of our business. We were named one of "San Francisco's Delicious Dozen" by Jim Wood in Image Magazine's Dining Issue; we were awarded a "toque" by the prestigious Gault Milleu's The Best of San Francisco, 2½ stars by San Francisco Chronicle food critic Michael Bauer, and were named "the Friendliest Restaurant in San Francisco" by Zagat when we opened. We have received positive reviews from our local newspapers (see Related Media below) and are included in many restaurant review guidebooks, and Richard Saul Wurman's Access San Francisco, as well as numerous international guidebooks in countries including Germany, Japan and Brazil. We received the 2013 Certificate of Excellence from TripAdvisor. 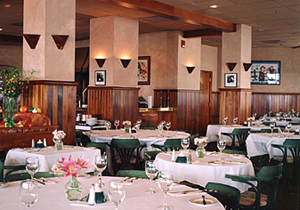 The restaurant has been featured on several TV shows including CNN and The Food Network's "Best of..." series. We have numerous wonderful spaces to accommodate whatever mood you may be in or however many or few people are in your party. The large DINING ROOM is described by Patricia Unterman in the San Francisco Chronicle as "a handsome and wonderful space. Hand-crafted wood, brass, and copperwork, sophisticated lighting and tasteful furnishings create an inviting American bistro look. The immaculate dining room glows." If you come alone and would like to sit at the COPPER BAR, hand-crafted by our residents, you can watch the chef prepare rotisseried chicken, as well as grill ribs with our special handmade barbecue sauce on our Italian Rotisserie. Our BBQ ribs and chicken were selected by The Food Network in their "Best of BBQ" series. 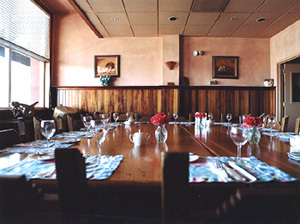 If you come in a large group, enjoy either of two PRIVATE DINING ROOMS. The BOARDROOM seating up to 40, has a warm and elegant atmosphere with copper fixtures, wainscoting, and cherry wood tables, and features Dugald Stermer's original wildlife portraits. The room overlooks the Bay on one side and an intimate garden on the other. The SOUTHWESTERN ROOM, seating up to 24, is furnished with two large carved pine tables and chairs, Taos-style "pie chest", and benches, all hand-crafted by the residents of Delancey Street at our ranch outside Santa Fe. Wonderful sculptures, weavings, pottery and drums crafted by Native Americans and art from throughout New Mexico are featured in this room. We are open 11am - 11pm daily except Monday. On Sunday we serve brunch from 10:00am to 3:30pm. We would be delighted to show you our private dining menus as well and design any special event you would like. We want you to truly relax and enjoy your meal in our "home". If we can do something better, please tell us.